We're proud to announce our latest addition to the family! 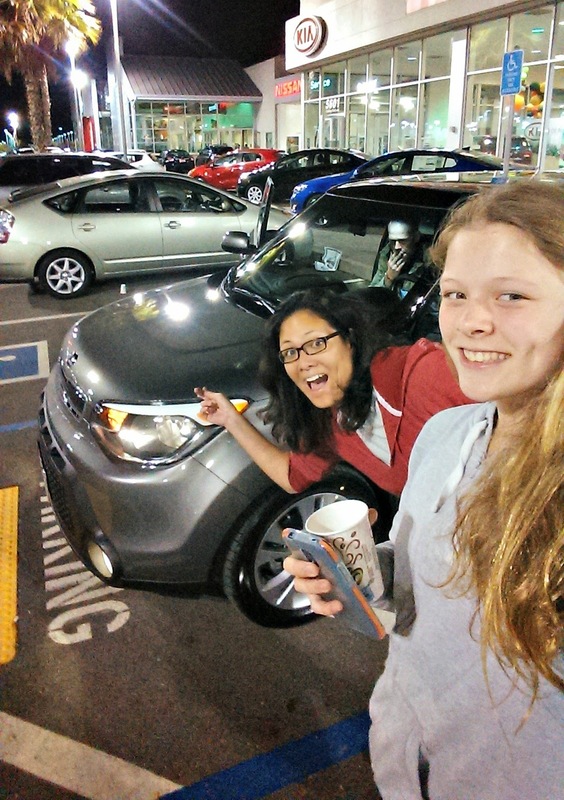 Before you order that cute onesie, know that my uterus is closed for business; our new baby is a Kia Soul wagon. Alfie's BMW sedan is nearing its 20-year mark, and we wanted a car to drive around town that didn't use up as much gas as our van. We decided on the Soul after test driving one for a week (take note, PR companies -- these programs work!!). We felt that the Soul had all the high end features we wanted, at a great price. When we saw the tv ads about great Black Friday financing on the Kia Soul, we decided to bite the bullet. The whole process took 3 days: we saw the ad on Friday, visited one dealer on Saturday, visited another dealer on Sunday, and picked up the car on Monday. The dealer visits were mainly to check out interior and exterior colors; we did all of the price shopping online and all of the negotiating via text. If you don't care about money, all you need to do is walk into a dealership with a checkbook, but if you want to get the best value for you money, you really need to do research. This seems obvious, but you need to know what you need to know! Know exactly which make and model you want to buy. If you're still deciding between a Honda and a Volkswagen, you're not a serious buyer. Know which options you are interested in. Otherwise, you'll be overwhelmed by all the packages and permutations, and you might end up purchasing a package that you didn't really want. Know which color or colors you'd be happy with. Know how much the vehicle is worth. Check Edmunds.com and KelleyBlueBook.com for the vehicle's dealer invoice price (supposedly the price that the auto company sells to the dealer, supposedly the lowest they'll sell the car for), MSRP (sticker price), and the "True Value Price" (an estimate of what you should be paying for the vehicle based on actual selling prices in your area). The kids were all shocked that just 3 days after we said, "We're buying a car", we had a car. Yes, we saw the Black Friday tv ad 3 days ago and decided to go for it, but we've been doing research on the Soul for about 1-2 months. We decided the Soul was our pick 3 months ago, after our test drive... and we actually started talking about replacing the BMW at least a year ago. So we've had plenty of time to explore our options (go with ZipCar vs. rent a car when necessary vs. buy a used car vs. buy/lease a new car) and to save up. Most car-buying sites say the best time to buy a car is at the end of the year, or at the end of the quarter, because dealers need to clean out their inventory and make sales quotas. Because we were prepared, we were able to take advantage of a good opportunity (the Black Friday sale) without feeling like we were being rushed or pressured to make a decision. It's so easy to get quotes these days -- simply have the dealers contact you by email. Instead of haggling with the dealers, we basically had the dealing haggling with each other, texting us with their offers. Some tried to pressure us into buying a color of car we didn't really want, because the color we wanted wasn't available anywhere in Northern California (it was). Some tried to pressure us into buying a premium package because apparently cars without the package were extremely rare (they weren't). Because we were getting offers from more than 1 dealer, we could see through their shenanigans! In the end, we went with the dealer who offered us a low price from the start -- other dealers wouldn't commit to a price and just said they would match the lowest offer. We ended up paying $1000 less than dealer invoice price! When we went to the dealership to pick the Soul up, I thought it would take less than an hour. After all, we had already agreed upon the vehicle, the selling price, and the financing. All we needed to do was inspect the car and sign the papers, right? Wrong. 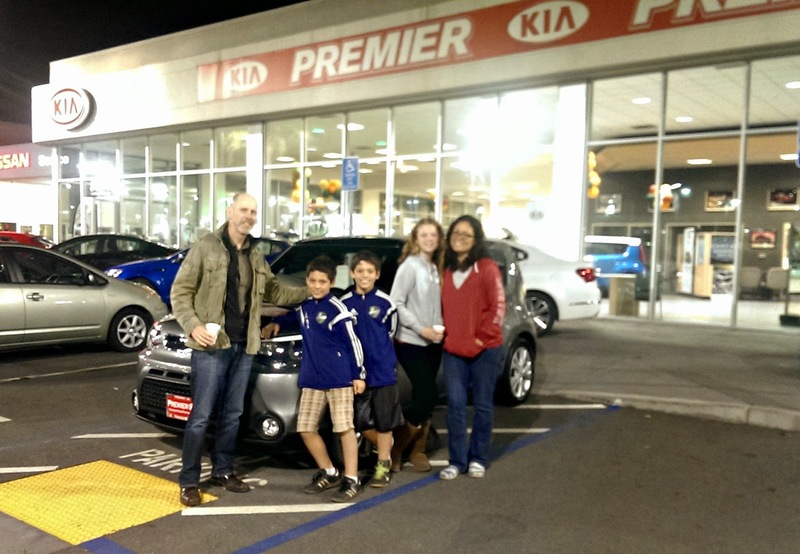 We were given the option of purchasing an extended warranty and a pre-paid service plan. Both sounded great, but we weren't prepared for either option. We needed to figure out the cost of servicing the car before committing to a pre-paid service plan. In the end, we decided to defer the decision (we get a month or two before we really have to commit) -- but we wasted time and energy at the dealership coming to that decision. We were all set to sign the purchase contract when I noticed that the sales price was higher than what we had agreed upon. We had agreed upon a different number the night before with the sales person, but the finance manager was given a higher price. The problem was, we had actually signed a paper saying we agreed to all the numbers. When we signed the paper, we had assumed that the higher price had sales tax included, but we were wrong. We should have clarified this, but we didn't. My heart sank, thinking there was no way we'd be able to prove that we had actually agreed upon a lower number. Fortunately, the finance manager consulted the general manager, who agreed to honor the original (lower-priced) agreement that we had made the night before. That was a close call -- you can bet we grilled the finance manager about every single number after our almost-mistake!